This Lowlands Single Malt has been triple-distilled, a Scottish exception to be discovered. Auchentoshan is one of the only Scotch Single Malt that have been triple-distilled, a general custom related to Ireland. This characteristic brings great purity to the aromas and results in a delicate, elegant Single Malt, with a truly unique fruity character. The 12 Year-Old version is the distillery's standard, resulting from a combination of Bourbon barrels and Sherry casks. This version reveals notes of precious wood and heady flowers. Established in 1823 on the outskirts of North Glasgow, on the foothills of Kilpatrick, Auchentoshan is one of the last three Lowlands distilleries still operating. This unpronounceable name with such a typically Scottish consonance means “the field corner” in Gaelic. Auchentoshan is the only Scotch Single Malt being triple-distilled, a custom usually associated with Ireland. This process imparts truly pure aromas to the distillate and creates a refined, elegant Single Malt with distinctive fruity character. 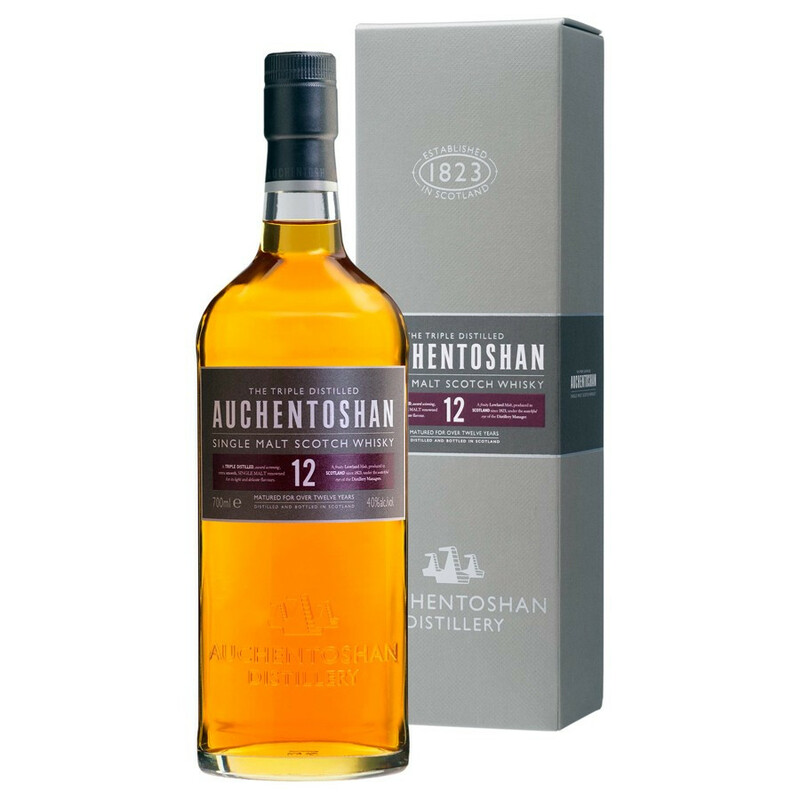 As a pioneer on many aspects, Auchentoshan is the only distillery offering a “Three Wood” Single Malt, successively aged in three different types of casks (bourbon, Oloroso sherry and Pedro Ximenez). The new Auchentoshan range includes 12 year-old, 18 year-old and 21 year-old whiskies and two new, extremely rare limited series presented in a decanter and distilled in 1957 and 1965. Nose: round and distinguished, with sherried toffee and hazelnuts. Honeysuckle, Iris and lavender form a floral bouquet, developing onto malting barley and sweet spices (cinnamon and cumin). Palate: sweet and balanced, the first hit is malted with a flavour of brioche, mid-palate bounces from ripe fruits (pear, apple) to subtle notes of menthol, wax and fresh nuts, with a marked return of heady flowers (violet, lavender) and dark chocolate. Finish: long and subtle. Moka and cake notes reveals a patissery and flavoursome edge lifted by a hint of salt. Beautiful woody/fruity balance, quite floral. Silver Medal, San Francisco World Spirits Competition 2012.